Materials scientist Liangbing Hu (also a member of the Maryland NanoCenter and the University of Maryland's Energy Research Center) and his team at the University of Maryland, College Park, have removed the molecule in wood—lignin—that makes it rigid and dark in color. They left behind the colorless cellulose cell structures, filled them with epoxy, and came up with a version of the wood that is mostly see-thru. They published their results today in the journal Advanced Materials. 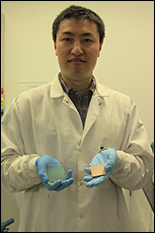 "It can be used in automobiles when the wood is made both transparent and high strength," said Dr. Mingwei Zhu, the co-first author of the paper, a visiting professor at the University of Maryland. "You could also use it as a unique building material." Remember "xylem" and "phloem" from grade-school science class? These structures pass water and nutrients up and down the tree. Hu and his colleagues see these as vertically aligned channels in the wood, a naturally-grown structure that can be used to pass light along, after the wood has been treated.